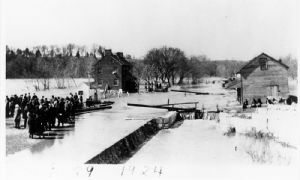 The flood of 1924 was caused by heavy rains in the Potomac valley on March 28 and 29—shortly after the canal had opened for the 1924 boating season. Since the flood of 1889 that had forced the C&O Canal Company into bankruptcy, the canal had been in receivership and under the authority the court. However the receivership was essentially controlled by the B&O Railroad that was the chief bondholder under the mortgage bonds of 1844 and 1878. After the 1924 flood, the B&O requested that they be permitted to leave the canal closed and the court agreed. The legal status of the canal at that time was that it could and would be quickly restored if it became necessary as it was not being “abandoned.” It was, however, generally recognized that this was a legal fiction and that the canal would never reopen, and indeed it did not.